Who is ready for a 4 day weekend!? Last week was pretty crazy as we wrapped up the second quarter at work. Myself and a few others in my office ended up being on call all weekend to push through some last minute customer orders before July 1st. That being said, I couldn’t plan on doing much, in case I was called in. But the Cave Man and I made the best of it, and it actually turned into one of those unexpected, terrific weekends. 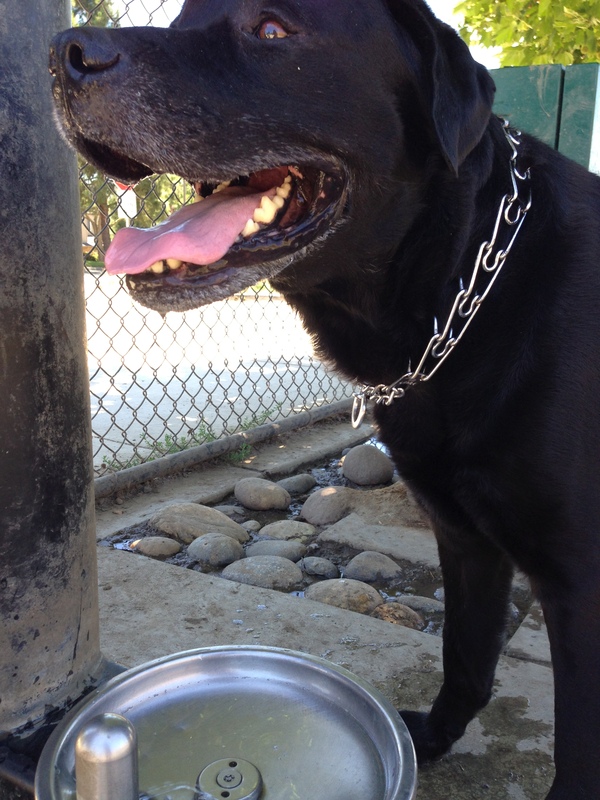 On Saturday, the Cave Man and I decided to skip Crossfit and take the Cave Dog to the dog park before it got too hot for him to be outside. Cave Dog loves the dog park. It’s so entertaining to watch him in this setting. First, he has to smell every shrub in the park, almost completely oblivious to any other animal. When he is good and ready, he’ll check out the company and make some friends. Especially when it comes to the little dogs – he follows them around, practically stepping on them, like ‘hey, hey, hey…wait up! I’m coming! Wait, where are you going?! Don’t worry, I’m right behind you! I got your back!’ Man, I love this dog. 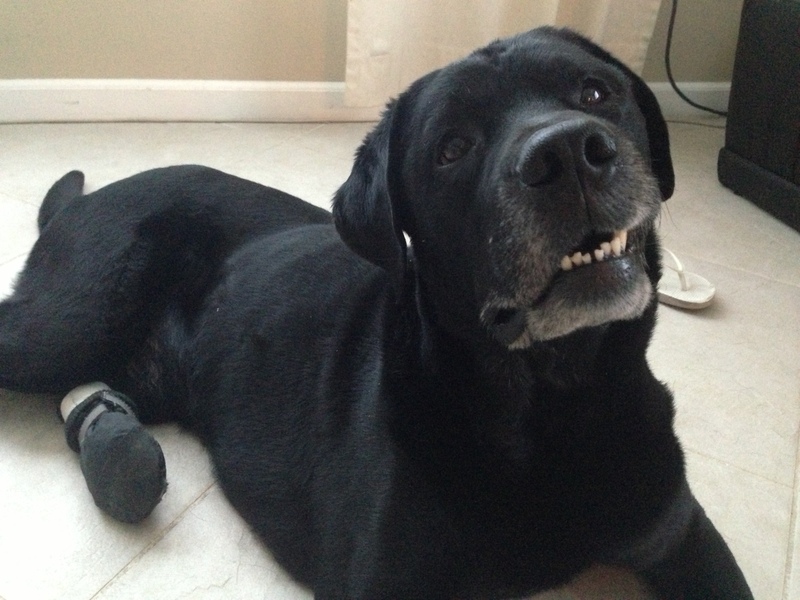 After tiring the pooch out at the dog park, we took him back home to cool off in an air-conditioned house. The dog has got it made. Unfortunately, we had to leave Cave Dog at the house for dinner downtown at our favorite Greek spot, Demitri’s Taverna. If you ever find yourself in the Livermore area of California, you have to stop here. It’s on the top of my list of Paleo-friendly eateries in the area and has such a great, fun vibe. Plus they give you shots of Ouzo if you sit at the bar. Need I say more? 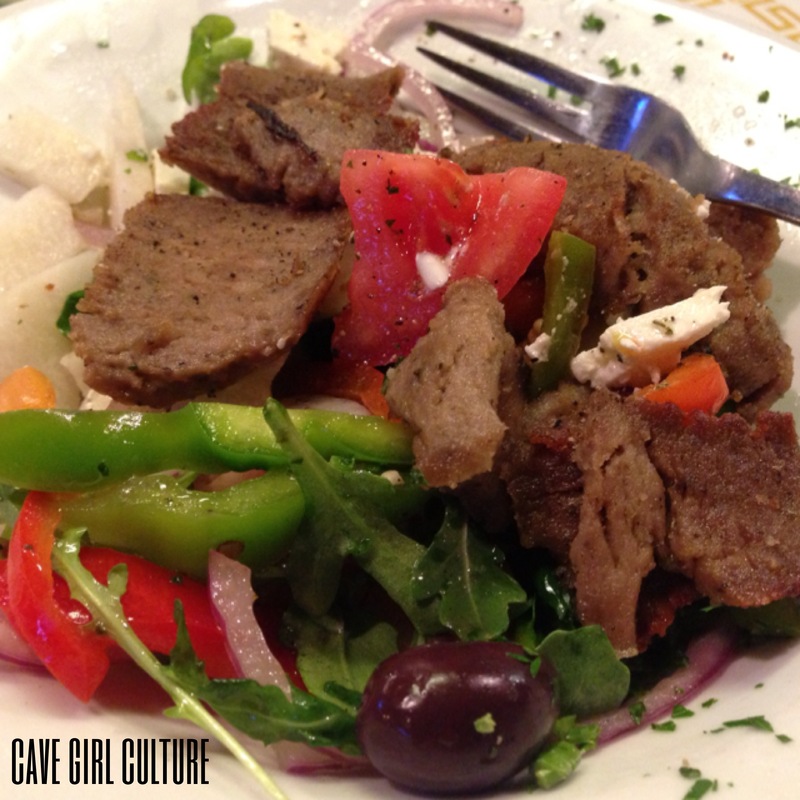 I’m not ashamed to admit I order the same thing every time – a small Greek salad topped with slices of gyro. Some may that call that boring. I say you’ve never had this salad. I stick to what I like. It’s a beautiful bowl heaping of bell peppers, tomatoes, red onion, baby arugula, kalamata olives, feta, and gyro. The feta is a splurge for me – I seem to tolerate it better than other dairies which is why I choose to include it every now and then. Don’t hate Paleo Police. But wait, what is gyro you ask? Only the best meat, ever! The gyro is a meat of choice, typically beef or lamb, seasoned with salt, pepper, paprika, parsley, garlic, and oregano, as well as a pinch of cinnamon, nutmeg, cumin, anise, coriander, fennel, and allspice. The meat is then roasted on a vertical spit, and sliced off as needed. It’s juicy, flavorful and sure to have you coming back for more. Well played Greeks, well played. The rest of the weekend went by pretty fast. 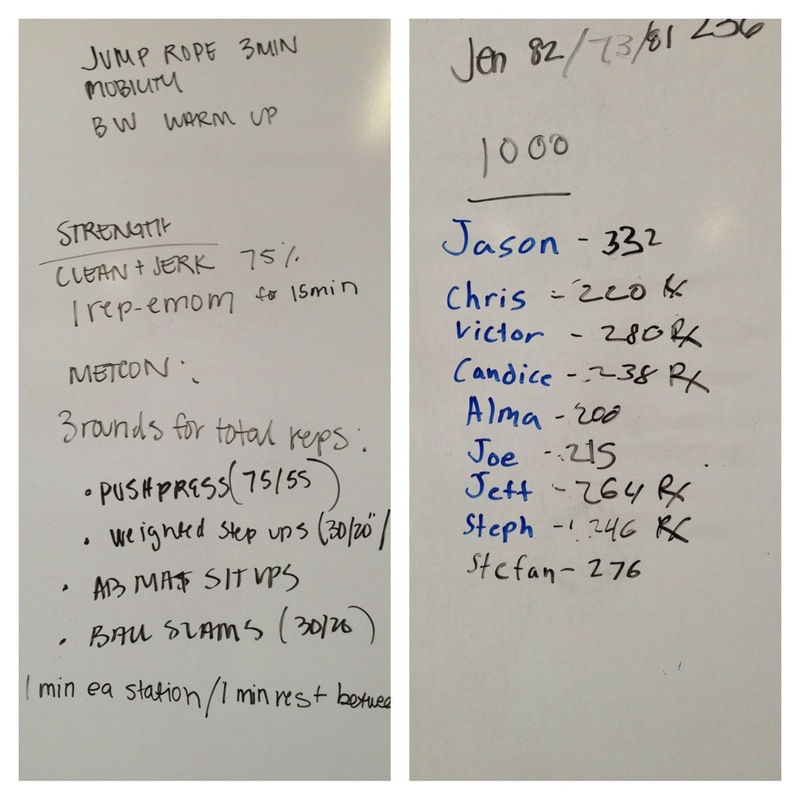 Cave Man and I kicked some major boot-ay at our Crossfit box, Crossfit 580 on Sunday. I was nervous going in, knowing the WOD (Workout of the Day) included push presses. A little background – in October of 2011, I dislocated my shoulder and tore my labrum doing an overhead squat. I have to be careful when lifting weight overhead, but I’ve worked hard to rehabilitate my shoulder and it’s much stronger now. I was able to RX the workout! Hello, 55 lb. push press, 20 lb. weighted step-ups, ab mat sit-ups, and 20 lb. ball slams. Hard work and consistency pays off! Unfortunately, I was called into the office and had to work well into Sunday night. The madness at the office led into a crazy Monday and Tuesday as well. Needless to say, by tonight (Tuesday) I was ready to unwind and relax. Might as well try Bikram Yoga for the first time! Right?! After the first 5 minutes, I’m thinking ‘Holy hell, what did I get myself into?” It took me about 20 minutes to calm my nerves, quiet my thoughts, and acclimate to the heat. I struggled with a few of the poses (Half Moon and Balancing Stick) but I know with practice I’ll get them down. I left feeling happy and relaxed….oh, and absolutely DRENCHED. I’ve never sweated so much in my entire life! I was tempted to break the silence in the room and apologize to the girl next to me when I flung my sweat all over her during the Triangle Pose. Oops. Now that I’ve got you all grossed out with sweaty jibberish, let’s talk food! What’s going on for 4th of July? I need to get my act together and get ready for the BBQ that Cave Man and I are hosting. We’re lucky to have a huge fireworks show across the street from the house, so we plan on rounding up some of our fellow cave friends for a pool day, grub and an awesome show. Cave Man is responsible for the BBQ and as usual, I’m responsible for the dessert. Twist my arm! 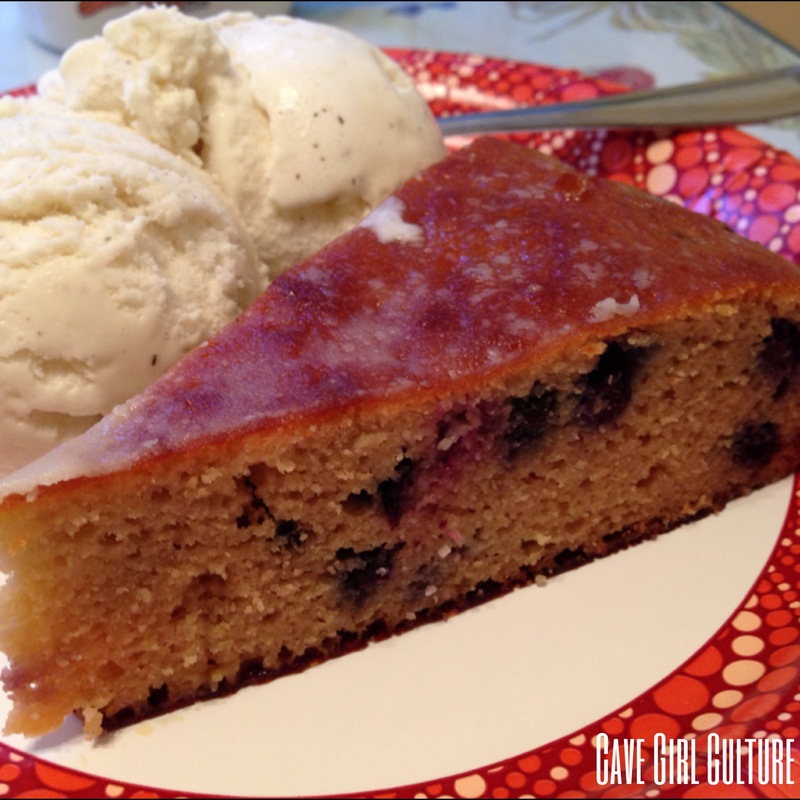 Because I’m not ready for the blueberry season to be over, I decided on making my lemon blueberry cake with coconut ice cream. It’s a proven crowd-pleaser and doesn’t require me to be in the kitchen all morning. Did I mention it’s delicious? Juice from 2 lemons, approximately 1/4 cup. Preheat your oven to 350°F and grease down a 9″ cake pan with coconut oil. I highly recommend buying a cake pan with a removable bottom, like this one. 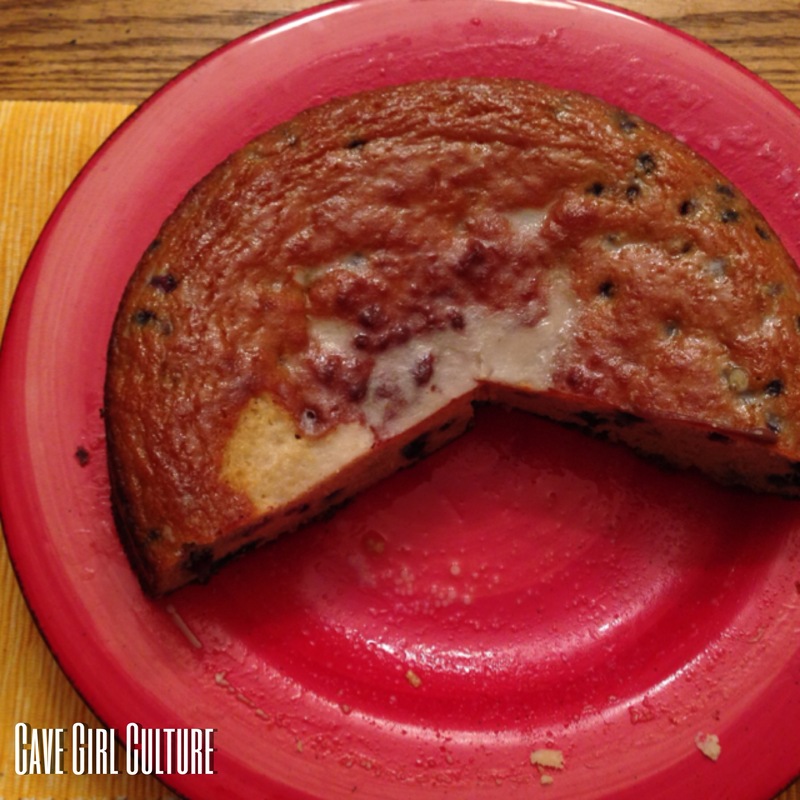 It makes taking the cake out of the pan, a piece of cake (ah, ha, ha). In a medium size mixing bowl, combine all the dry ingredients and set aside. In a separate mixing bowl, combine all the wet ingredients, with the exception of the blueberries. Slowly add in the dry ingredients and mix until combined, by hand or using an electric mixer on low. Fold in the blueberries very gently. I cannot stress this enough. I got a little too zealous my first time around and ended up with a blue-ish, green-ish batter that looked like it came out of Hulk Smash. Not appetizing. Pour the batter into the greased cake pan and bake for approximately 30 minutes. As always, use the toothpick method to test doneness, as different oven temperatures make cooking times vary. While the cake is baking to perfection, prepare the lemon glaze below. In a small saucepan over low heat, combine all ingredients in order. Once it begins to simmer, remove from the heat and let cool until the cake is ready. 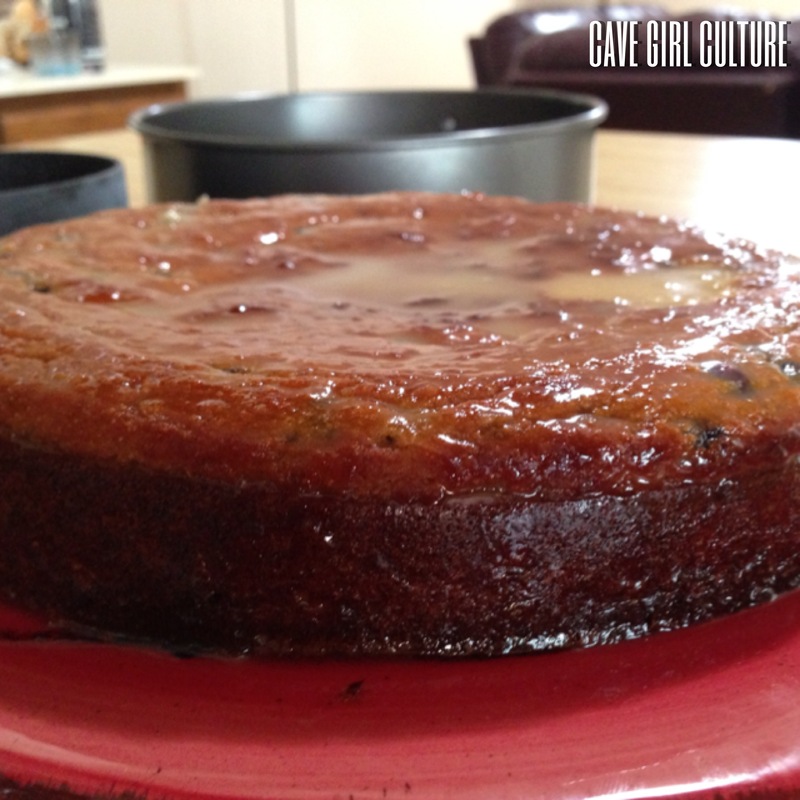 Spread the glaze evenly over the cake and refrigerate for at least 30 minutes so the glaze can harden a little. Keep refrigerated until ready to serve. Add coconut ice cream and try to save some for your friends and family. If they’re nice. Hope everyone has a fantastic and safe 4th of July!